Yardage Design is giving one lucky reader the chance to win a gorgeous handprinted market bag and tea towel! 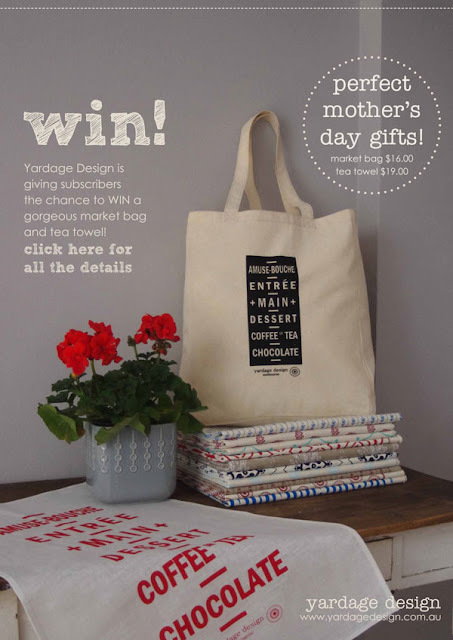 visit Yardage Designs online shop (www.yardagedesign.com.au) and browse their range. Return here and comment below telling us which market bag and tea towel you would choose if you win! for a second entry, visit Yardage Designs facebook page (https://www.facebook.com/pages/Yardage-Design/138079332899448), become a 'liker', and return here to leave a second comment. The winner will be contacted by email and must reply with their postal address with 14 days of notification. In the case that the winner does not contact us, a second draw will take place from the remaining entrants. All ready a TMI subscriber and now a FB liker! Love the vintage retri tea towel! Now a facebook liker too and subscribed to your awesome mag! I love all Nic's designs, but for this giveaway it's got to be the vintage tram roll market bag and the retro spice canisters tea towel. I've subscribed to your lovely mag and am a FB liker too. Thanks! I love the Tram Roll in black and white, just lovely. i fb liked ! thank you guys ! My favourites are the black tram roll menu tea-towel and the vintage ice market bag. Tasty Vintage tram roll tea towel & vintage tram roll menu market bag. Decisions, decisions! Ok, so I'd chose the Vintage Ice Coupon Market bag and the Retro Spice Canisters tea towel. Congratulations Rie, you are the winner of the Yardage giveaway! If you could please email editor@tickletheimagination.com.au with your details, I'll pass them onto Nicole. i'd have the vintage ice coupon bag and the vintage tram roll tea towel - and i wouldn't use it to dry the dishes either! I am already a subscriber and just love the Vintage Ice Coupon bag and the Tasty Vintage Tram Roll tea towel - they are so unique! I am now a FB liker as well! Loving the Vintage Tram Roll Menu Market Bag and Black Vintage Tram Roll Menu Tea Towel. Lots of fun and it would be nice to have a gorgeous bag for my groceries! Hi, If I were lucky enough to win, I would choose the vintage tram roll menu market bag and black vintage tram roll menu market tea towel! LOVE, LOVE, LOVE Yardage design! favourites are the Vintage Tram Roll Menu Market Bag & Black Vintage Tram Roll Menu Tea Towel. I am a Yardage Design FB liker from the start! Got to go with the tram roll menu bag as well!! Like the ice coupons as well. Love the Ice coupon market bag and the Tasty tram roll tea towel! I would have to pick the Black Vintage Tram Roll Menu Tea Towel. I love the "AMUSE-BOUCHE" at the top...tantalising. Vintage Tram Roll Menu Market Bag to match and put the yummy goodies into. I have to say...more gorgeous fabrics. Adore the Ice coupon market bag and the Tasty tram roll tea towel! All signed up both FB pages. Hope to get lucky! I would like to pick "Vintage Ice Coupon Market Bag" very bright and love it. I would love the Tasty vintage tram roll tea towel and the vintage tram roll menu bag, lovely, simple, striking designs! Congratulation to Rie, winner of the Yardage giveaway!